Get acquainted with Northern California's Wine Country and the Pacific Coast on our six-stage Sonoma Bike Tour that even the pros would envy. 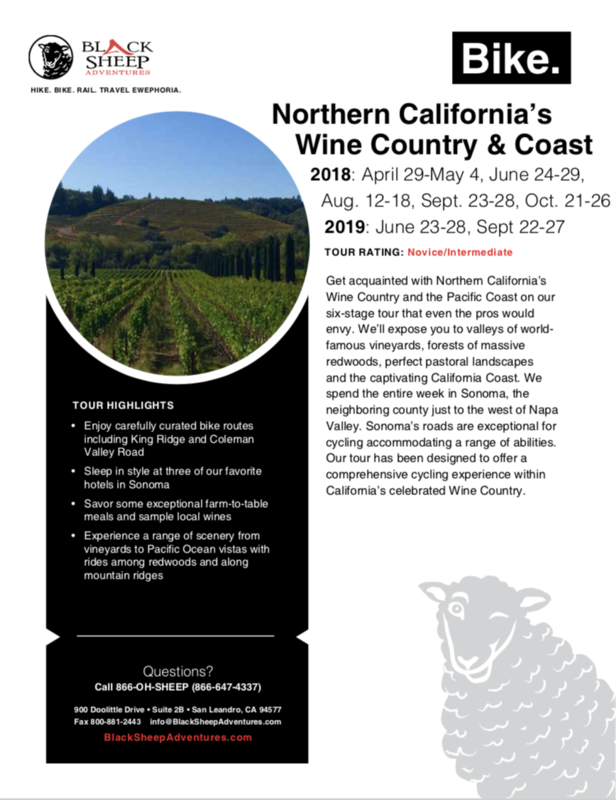 We’ll expose you to valleys of world-famous vineyards, forests of massive redwoods, perfect pastoral landscapes and the captivating California Coast. We spend the entire week in Sonoma, the neighboring county just to the west of Napa Valley. Sonoma’s roads are exceptional for cycling accommodating a range of abilities. Our Sonoma Bike Tour has been designed to offer a comprehensive cycling experience within California's celebrated Wine Country. A LEED-certified "green" hotel ideally located in downtown Healdsburg. Features a living roof, bamboo flooring, solar heating, a heated pool, bar and restaurant. This fantastic accommodation is a AAA 4-diamond lodge overlooking the Pacific Ocean, Doran Beach State Park and the spectacular green bluffs of Bodega Head. All 84 guestrooms have ocean views, sweeping vistas, and sea breezes all enhanced by bird calls and calming sounds of the distant fog horns. Full service spa with pool and hot tub, and “one of the most romantic restaurants in Sonoma County”.